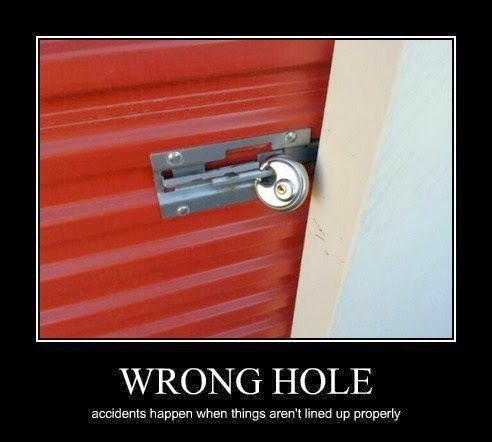 Thanks to Insider Threats for tweeting this image of a storage locker whose latching mechanism is locked into the open position. The top piece of metal should slide over so that the 2 holes in both top and bottom line up before you put the lock in. 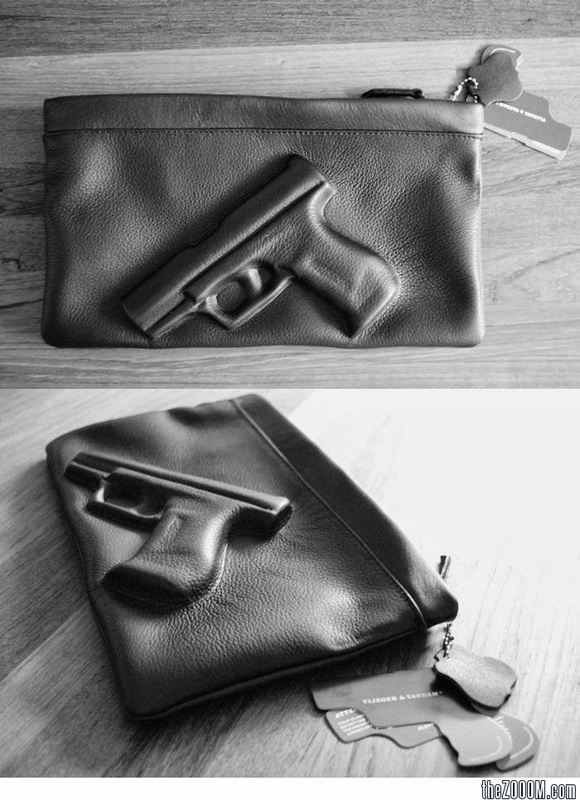 I can definitely see muggers deciding to look for easier prey when they see the outline of a gun in someone's purse. 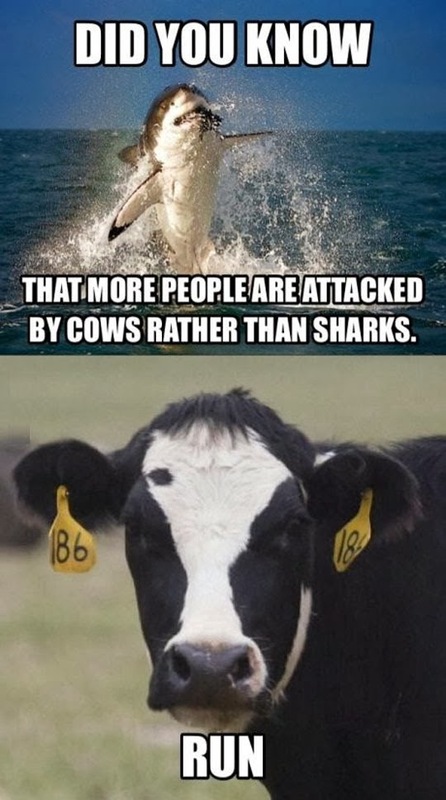 Maybe even if they see the outline of a knife. I'm not certain what they'd think about the outline of a pair of hand cuffs or a crucifix, though. Despite what you may have heard in the media, computers are actually pretty dumb. As a result it will always be possible (and in some cases pretty easy) for people to fool automated systems. 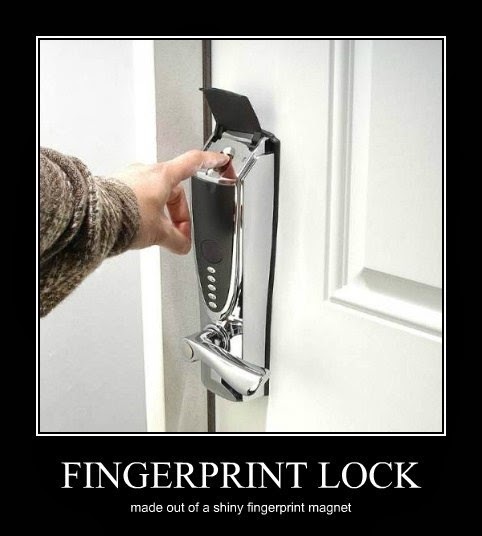 Just in case you ever get the idea that you can protect encryption keys by encrypting them. 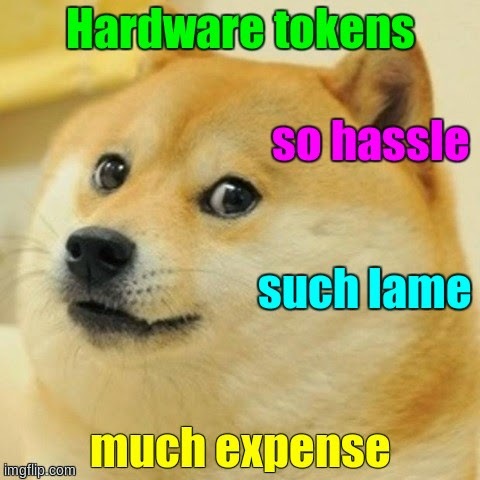 Thanks to Nick Owens for tweeting this doge meme pointing out some of the drawbacks of physical authentication tokens. Should have put at least one of those in a safe (place). 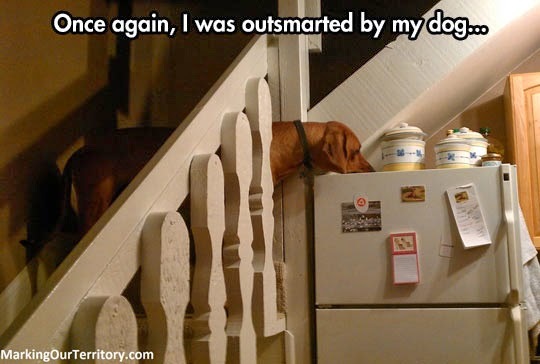 Clearly, when the stairs go right by it, the top of the fridge is NOT a good hiding place for dog treats. 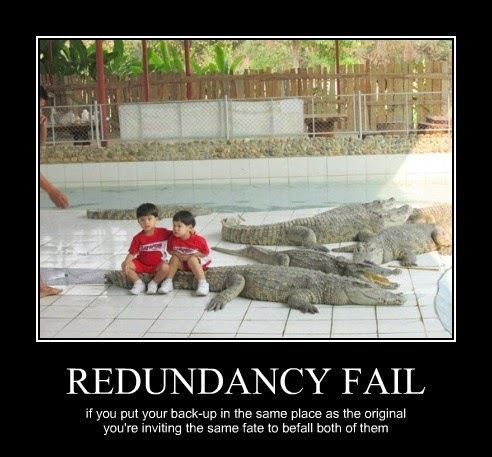 Different people have different ideas about what corrective measures are appropriate. 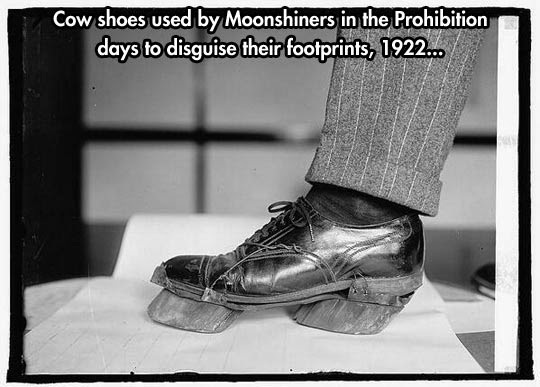 We inevitably leave evidence behind as we go about our business (whether that business is legitimate or not) but sometimes we can make that evidence look like something else. 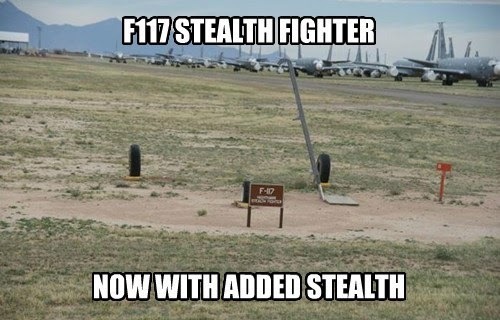 When someone uses stealth, it should be almost like they're not even there. ALMOST. 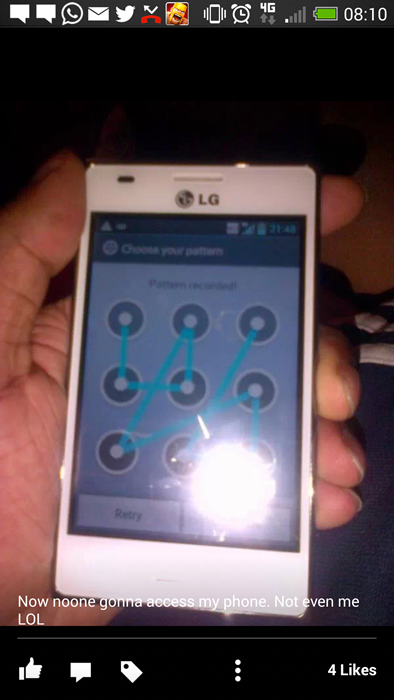 When is privacy not privacy? 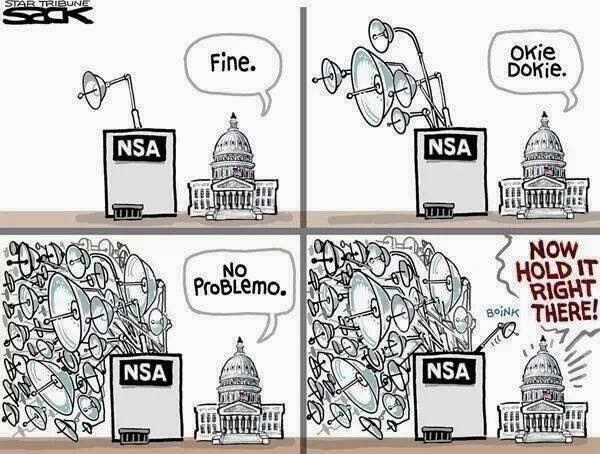 Do you ever wonder if perhaps this is what most people complaining about the NSA are actually doing? Can you really consider your personal information private if you are actively working against your own privacy? 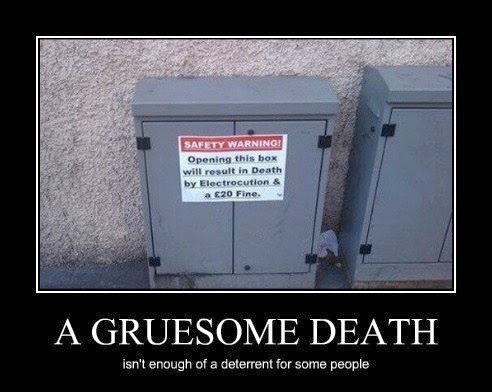 Thanks to Ash Warner for tweeting this evidence that deterrence alone is sometimes not enough. 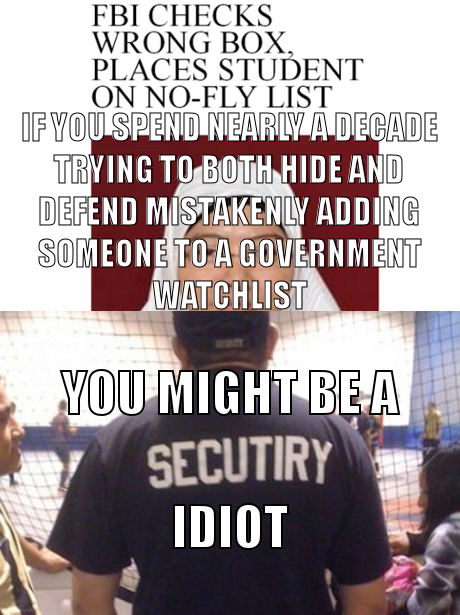 As the old saying goes, what's good for the goose is good for the gander, so if the government wants to allow it's intelligence agencies to spy on people, it should get spied on as well. 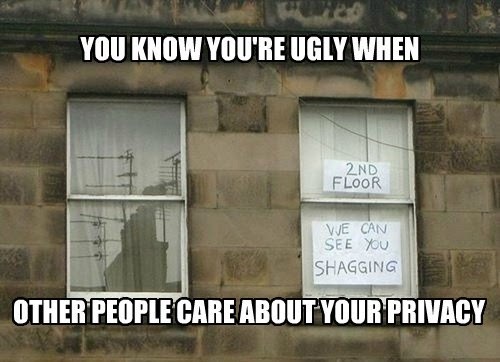 The ugly truth about privacy is that people usually only care about their own, rarely about other people's, so it's generally up to you to protect your own privacy. 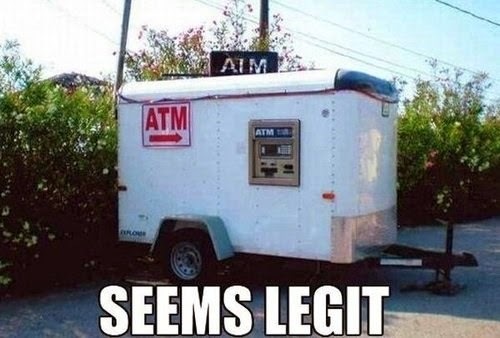 It's hard to trust an ATM that might not be there 5 minutes from now. 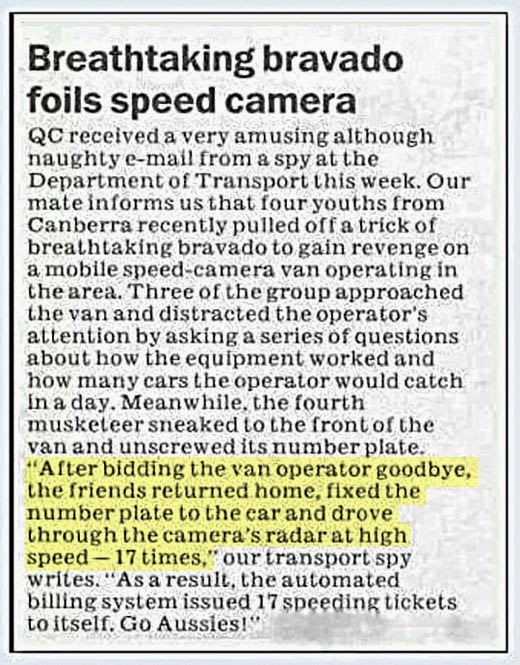 If it's too mobile, how can anyone 'official' keep track of it and check it for tampering on a regular basis? 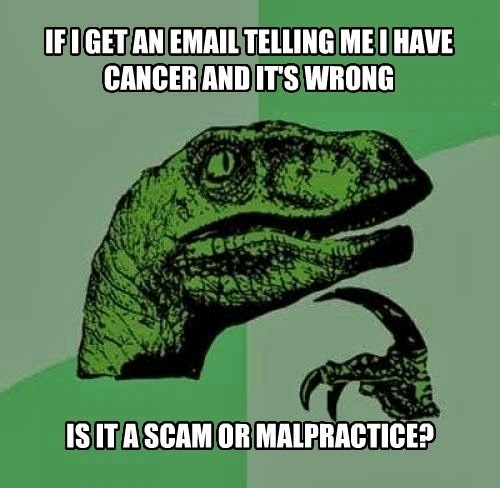 A diagnosis of cancer may not seem like it should fall under the heading of "Too Good To Be True", but free, unsolicited, and useful medical advice? That actually does sound like it's "Too Good To Be True". 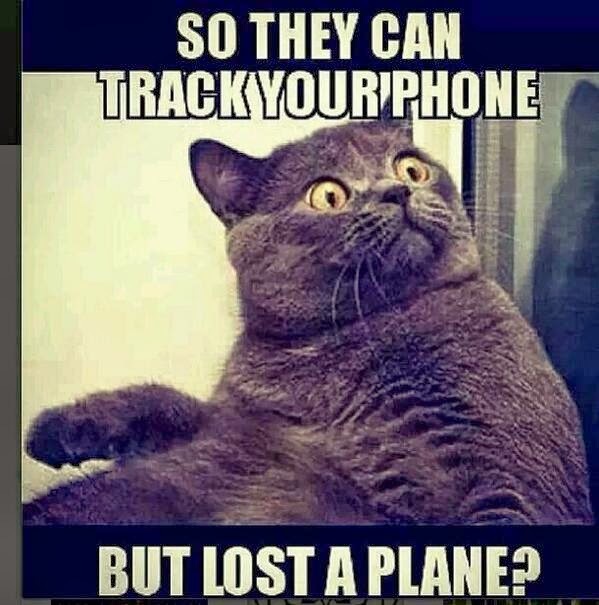 Considering the long history terrorists have with planes, and considering all the money governments spend on fighting terrorism, you'd think they'd have kept better track of that plane. 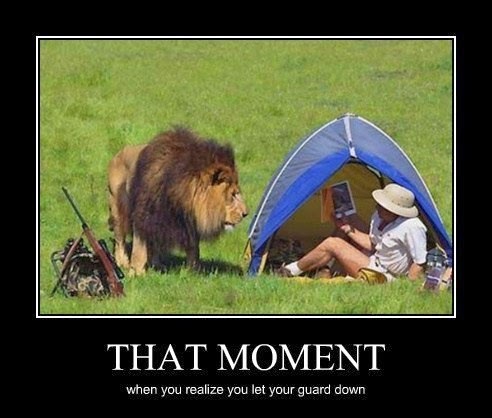 We all let our guard down from time to time, and sometimes it comes back to bite us - whether we find ourselves staring at a hungry lion with our only defense in the background, or you've just tried to open a PDF file and nothing happened, that's when you know it'll be one of those times. The Internet hardly ever gives you advanced warning that you're going to need protection. That's why it's important to always have protection (whether it's the kind that protects you or the kind that protects your computer). I can see the fail, can you see the fail? 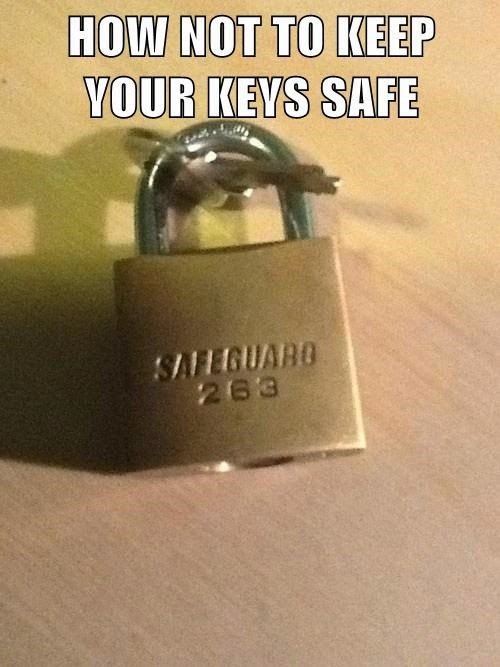 Unless you can pick locks or have a second key, that key isn't going anywhere. 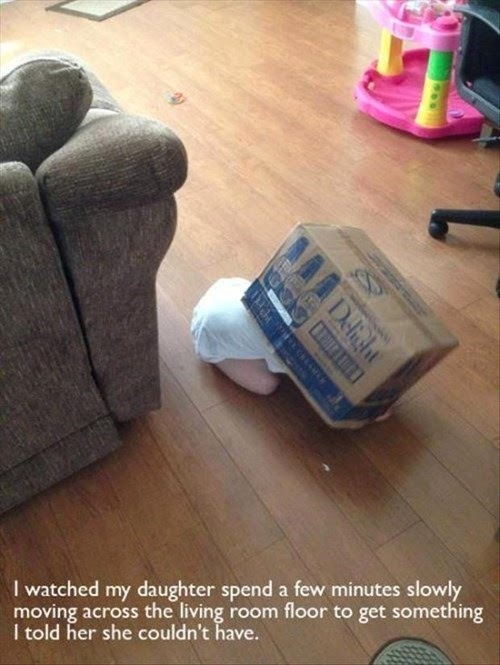 This kid may have failed at the execution of stealth, but the plan still seems quite clever for her apparent age. 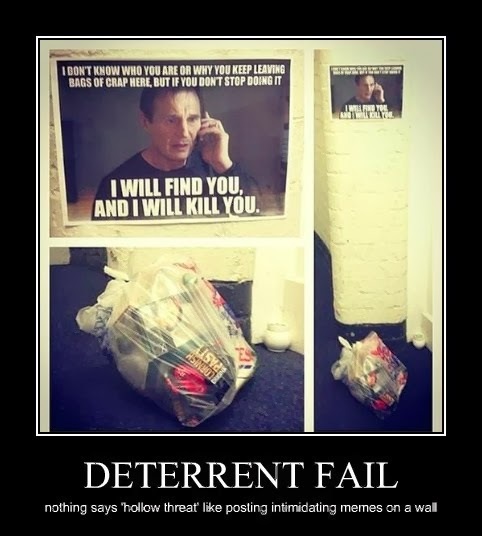 If you aren't Liam Neeson, you probably can't pull off that threat, and you certainly can't pull off that threat by taping a print-out to a wall. 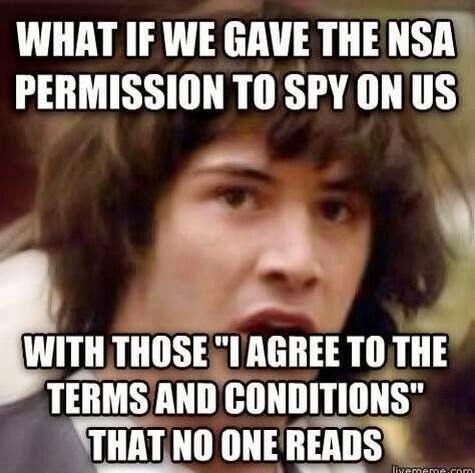 Thanks to Tiny Timmy for tweeting this Conspiracy Keanu image macro. Also for giving us a brand new reason to dig into EULAs a little deeper. Thanks to Tentacle Sixteen (?!) 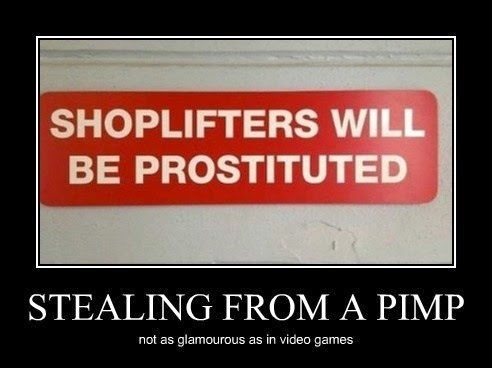 for tweeting the image. 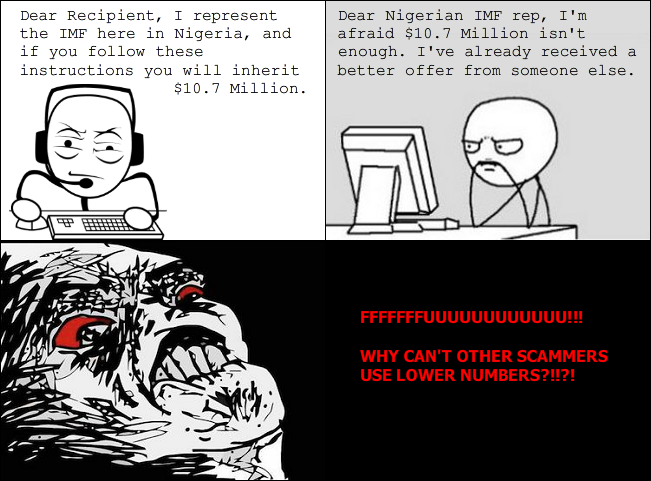 As for the social engineering ploy used here, wow, that is so low. 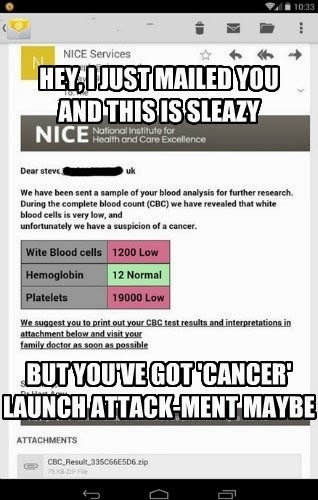 By the way, NICE says this isn't actually them. 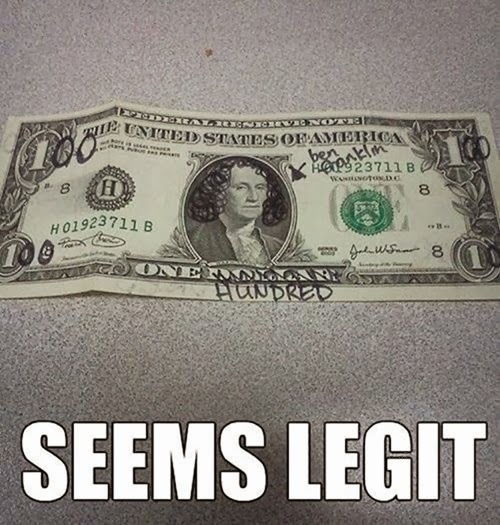 Gotta Get Those Washi- Err... Benjamins! If only forged paypal/bank emails were as easy to spot. Some of them are close, but none are really this easy. I definitely have mixed feelings about the NSA stealing botnets (as pointed out by Christopher Soghoian). 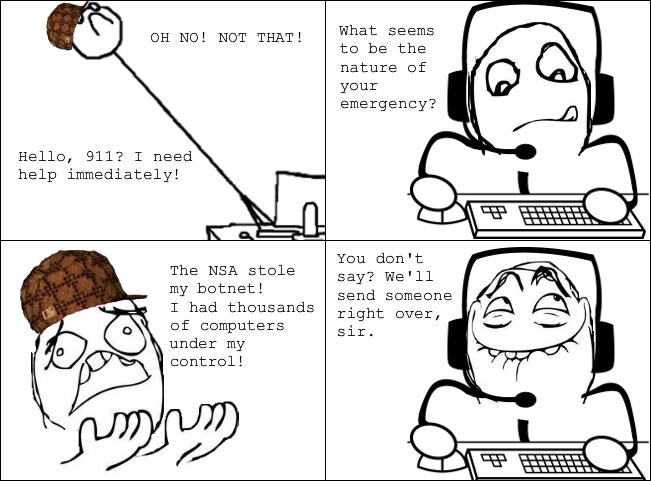 Yeah, it takes control of the bots away from the criminals who pwned those machines in the first place, but it's not like I trust the NSA with a botnet. Clearly, two of the same kind of barrier is no more difficult to bypass than just one. That's why defense in depth needs the barriers to be of different types. Thanks to my spam folder and my colleague Hamid for the inspiration for this. 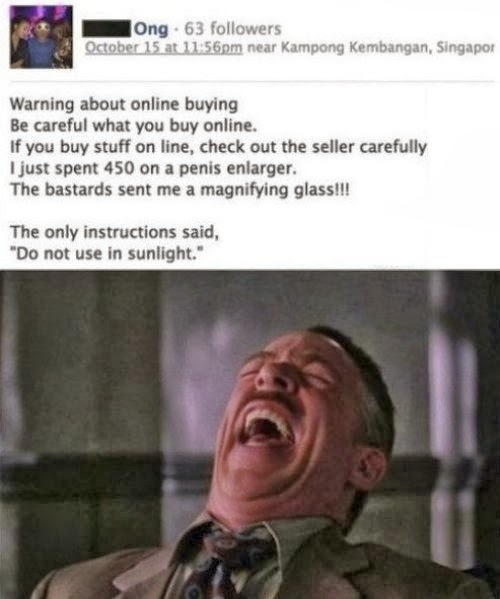 "Caveat emptor" is a very old Latin phrase (yeah, so old it's in Latin) that means "let the buyer beware" and as this example shows, it's excellent advice when buying things online. 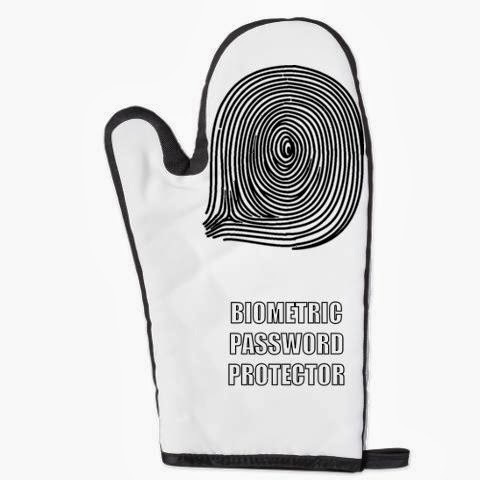 Well, since people really seemed to get a kick out of the idea from last Friday I figured I'd make the Biometric Password Protector a reality. Unlike in the comic, the idea here isn't to protect the confidentiality of your biometric password but rather to protect the integrity. I know from personal experience that if you burn your fingers it can (at least temporarily) alter your fingerprints, and you don't want that keeping you off the Internet. Isn't it funny how we much we can under or overestimate potential threats. Also available in paper bag form. Err, well, cracking, I suppose. 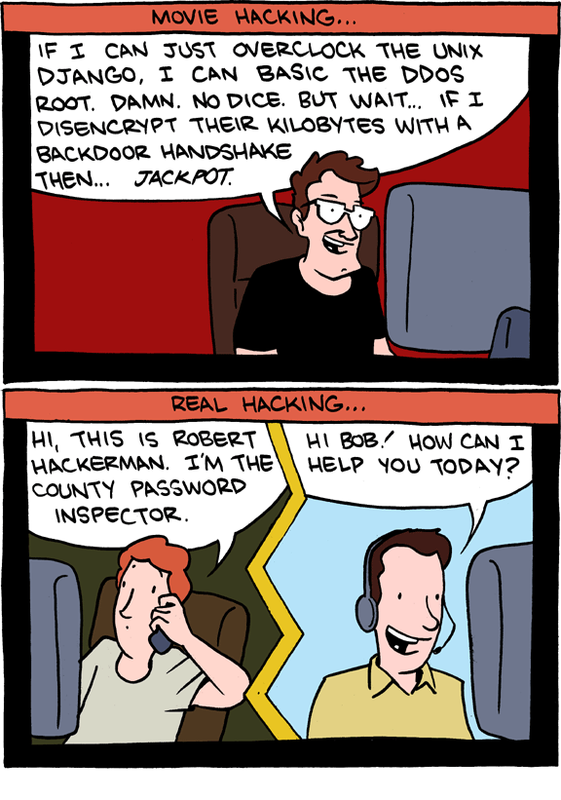 But the comic (and admittedly a wide swath of the security community and media at large) calls it hacking. 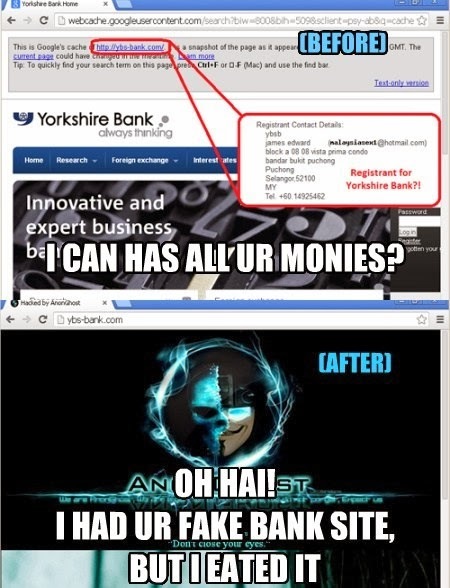 You gotta love it when website defacers and phishers inadvertently fight. You Get Six Feet of Snow, We Get Six Feet of Alligator! i don't think i want to go to florida for the winter. 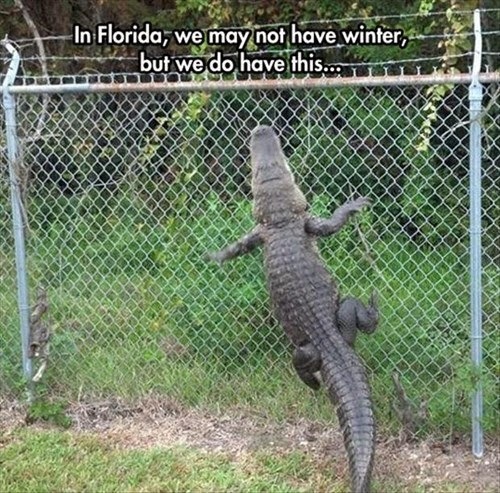 if i had to choose between the cold and fence-climbing aligators, i'd take the cold. a simple pair of mitts and a warm hat can do wonders to protect me from frostbite, but apparently even a chain-link fence and barbed wire won't protect me from gator bites. 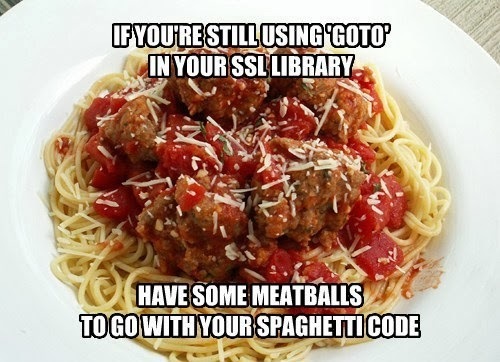 So, not much more than a week after Apple's "goto fail" bug, the GnuTLS library is found to have a similar problem and what's all over the code again? More "goto" statements. It may not be the cause of these bugs but it's strongly correlated with the shoddy coding practices that lead to the bugs. 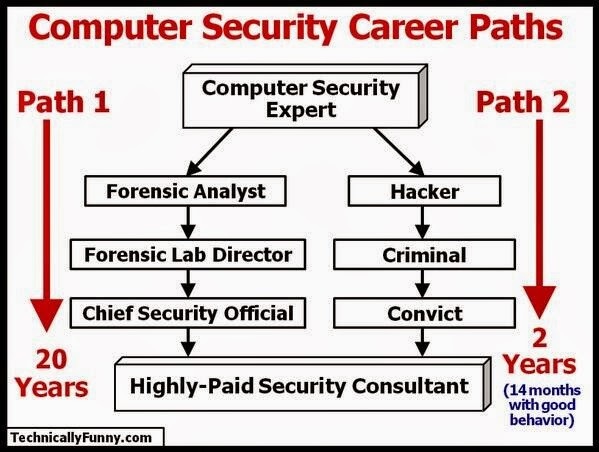 Thanks to @Trojan7Sec for tweeting this commentary on the state of where computer security "expertise" comes from. 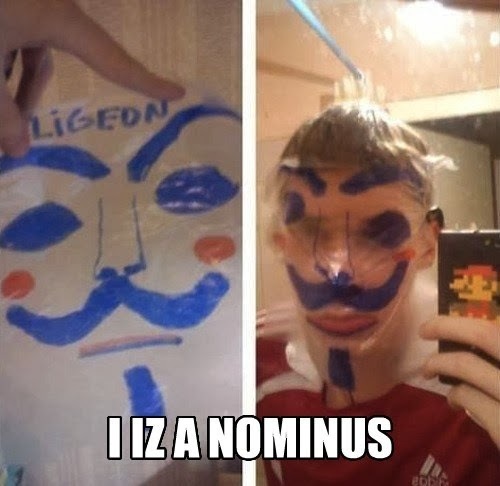 Nothing makes you seem like an ominous anonymous figure like putting a plastic bag over your face and misspelling "legion". Before anyone gets bent out of shape about me associating anonymous with threats by labeling this a lolthreat, some members actually are bad people, and this one really seems like a threat to himself. 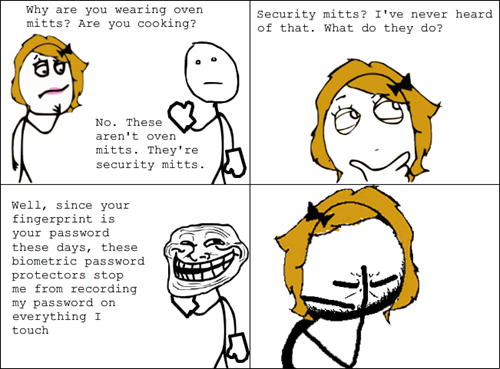 No One Can POSSIBLY Crack the Code Now! Hard for other people to guess? Yes. Kept secret instead of posted on Facebook for everyone to see and 'Like'? Well.. that would be NO. It's good to see an acknowledgement that finger swipe passwords are typically fairly weak, but this doesn't seem like the best way to address that. 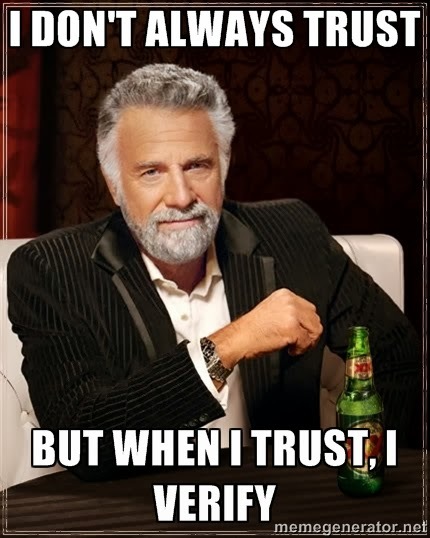 Thanks to Julio Canto for tweeting this mash-up of the most interesting man in the world and the idiom trust, but verify.